This walk is perhaps the most beautiful on the whole of the coast path. 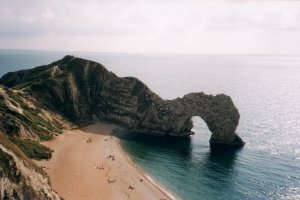 Starting at the beautiful Lulworth Cove, it passes the famous and much photographed St Oswalds Bay and Durdle Door. 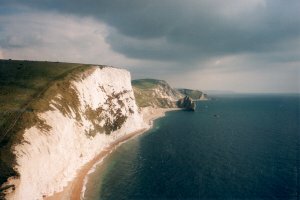 After Durdle Door, the crowds go and there are some steep climbs up the chalk cliffs, but you're rewarded with stunning views around the coast. 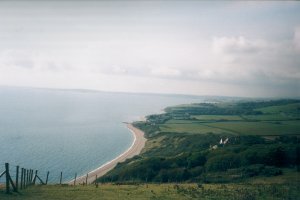 The view from the top of White Nothe is excellent, with Ringstead bay below. 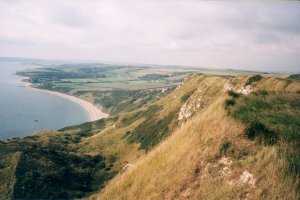 After White Nothe cliff, the path becomes less severe with smaller gradients, passing through the village of Osmington Mills and then into the popular resort of Weymouth. 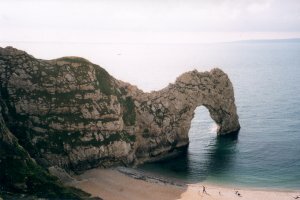 There are several bus services which run to Lulworth and Durdle Door. The first, is First Southern National service 103, which runs four buses a day in each direction (a 2 hourly service) on Mondays - Saturdays between Wool, Lulowrth, and Dorchester. It stops at the station at Wool, and departs a little over 10 minutes after some trains arrive from London and Bournemouth. It takes around 15 minutes from Wool. Finally, Dorset Linkrider / Weaverbus service 30 runs between Wareham (station), Lulworth, Moreton (station), Osmington and Weymouth. The service is infrequently, and varies depending on the season. All these bus services stop at rail stations on the London Waterloo to Weymouth rail line. Timetables of all these services are below. Accommodation in Lulworth is limited. There are two Hotels that I know of, The Lulworth Cove Hotel and the The Cromwell House Hotel. 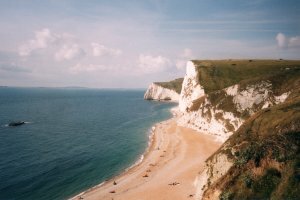 If you prefer Self Catering accommodation, there is the Durdle Door Caravan Park (Tel 01929 400200). You're spoilt for choice if you're looking for accommodation in Weymouth. 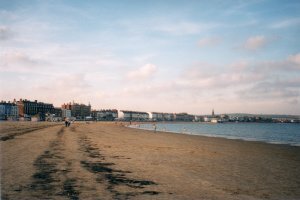 The links below provide information on finding accommodation in Weymouth, and there is also a good tourist information centre on the sea front. 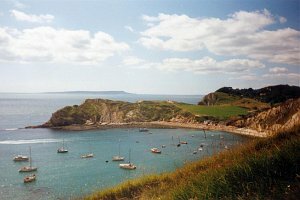 Lulworth cove is a beautiful location to start the walk. The small village has a visitor centre (which is well worth visiting), a couple of cafes and a pub, as well as some small shops. I'd recommend walking down to the cove whilst you are here, it really is very pretty. The coast to the east is owned by the MOD, and access is only permitted on most weekends and during the summer months, so do check if you want to walk east at all. The Cove is very sheltered and so the beach is popular. The visitor centre here has a lot of information about this section of the coast, as well as some videos of the area during storms. Also, make sure you see the impressive Stair Hole before you leave Lulworth. 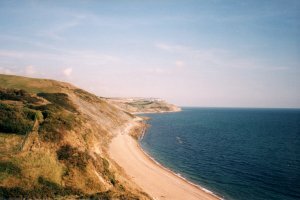 The Dorset and East Devon section of the coast path has recently become a World Heritage Site, because of the large number of fossils found in the area. The coast path to Weymouth starts at the back of the car park, and should be quite obvious, since it climbs up quite quickly. This part of the path is one of the most walked sections of the coast, as far as Durdle Door, so you might find the path quite busy. The path here has recently been improved, as it suffers a lot of erosion from the many people who use it. 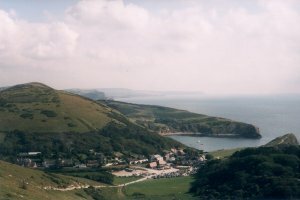 The path climbs quite quickly out of Lulworth, but gives excellent views of the cove below as you climb. 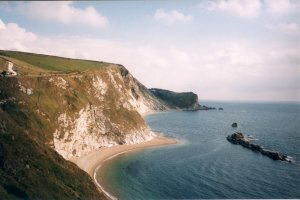 The path climbs to the top of Dungy Head, passing the beautiful Man O War Cove, with a group of rocks a little off the coast and St Oswalds Bay. 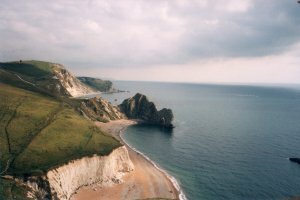 As you reach the top, you get superb views of Durdle Door, one of the most photographed views of the coast path. 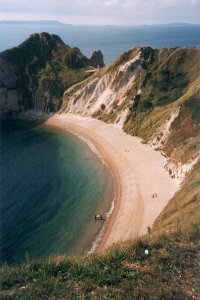 The beaches here are excellent, and there are steps down to both Man o War Cove and Durdle Door beach. Both are very clean and mostly shingle, but they do slope quite steeply. 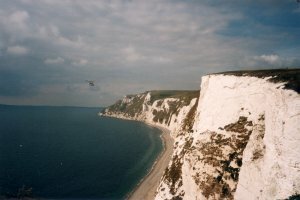 The scenery here is about the best on the whole coast path, and the white cliffs contrast with the green fields in land and the clear blue sea. There is often (bot not always), a snack van on the path near Durdle Door, though don't rely on it. There is little change of refreshment beyond Lulworth until Ringstead Village and Osmington. 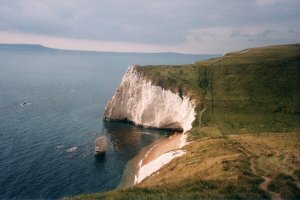 After Durdle Door, you'll probably have the path virtually to yourself. 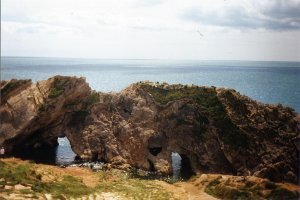 It does however climb steeply away from Durdle Door. The cliffs are very steep and don't have steps up, so progress can be slow. The views from the top of the headlands are very impressive though. 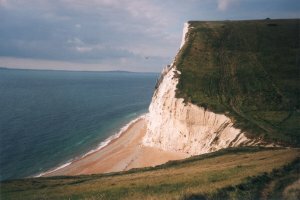 You climb Swyre Head, before the path drops down to sea level again to a pretty bay, just before Bats Head, with a small white chalk stack. 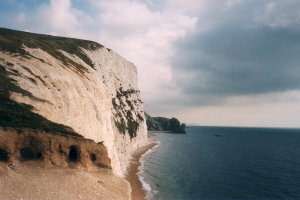 Bats Head also has a small arched which has formed underneath it. 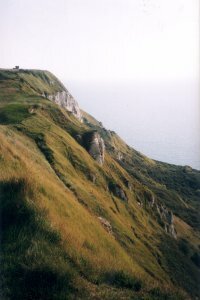 The path climbs up over Bats Head, which is again a steep climb. 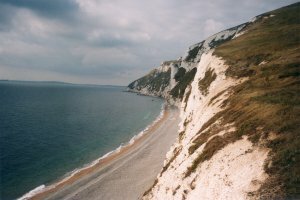 The climb up White Nothe is a bit easier and the views here excellent, particularly of the cliff ahead as you climb it. 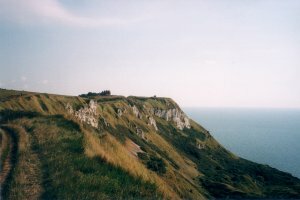 You might be surprised to find a small row of houses on the top of the cliff here. 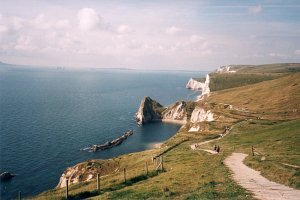 You also get good views back to Durdle Door and Lulworth, but this is about the last chance to get a good view of Durdle Door and Lulworth Cove. 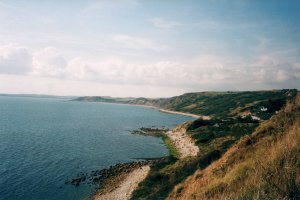 The top of the cliff is a little flatter, and you get good views round Ringstead Bay to Ringstead Village and Osmington. The height of the cliff means you can see a long way round the coast. The path descends fairly slowly towards Ringstead. 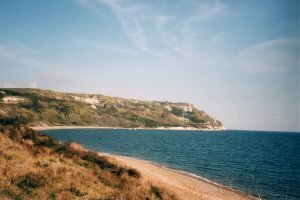 As you descend White Nothe round Ringstead Bay, the path goes slightly inland, briefly following a small road to where there are some houses, before you arrive at Ringstead Village. There is a public toilet here and a small shop on the edge of the car park. 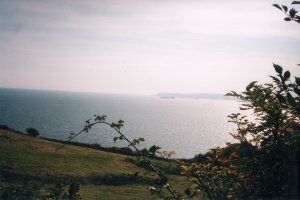 The path is lower level from here, though the edge of a small wood until you arrive at Osmington Mills. The path goes quite literally through the beer garden of a pub here, so it's a good opportunity to stop for refreshments. The path goes a little inland after Osmington Mills due to the land slips which have taken place on the coast, but only for a very short distance. The path climbs up to Black Head, then down again but the climb is fairly gentle. There is some sort of adventure holiday camp just along the coast from Black Head. 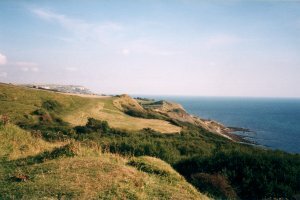 After this, the path goes round Redcliff Point from where the path descends slowly towards to Bowleaze Cove. When I walked this section of the path, a small part of the coast path had collapsed, meaning I had to climb over a low fence and into a field to get past the collapsed part of the path. With any luck the path and fence will have been moved further back. Bowleze Cove is sadly somewhat spoiled by the large and noisy holiday camp, where there is usually music playing, rides and often lots of Jet Skis in the water. The sign "Private Residents Only - Passes must be shown" makes it sound more like a prison than a holiday camp! 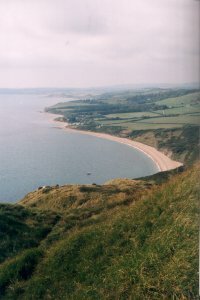 At Bowleaze Cove you can walk on the beach the whole way into Weymouth. If you prefer not to, the path sticks to the road over Furzy Cliff. After that there is a new footpath along the back of the beach into Weymouth. 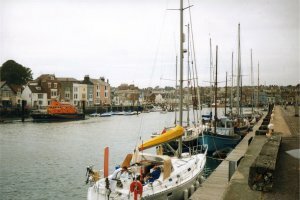 Weymouth is a pleasant holiday resort, with an excellent beach, particularly at the Quay end. The sand is very soft and the sea gently slopes, making it excellent for bathing or swimming in. It does get very busy in the summer months though. There is a large range of shops, cafes and pups in the town centre and around the Quay. The Quay is also quite pleasant with lots of boats to watch. Weymouth is also still a working port - the Condor Ferries leave from here to the Channel Islands and St Malo. There are good views of Portland from here, and in the summer open top buses run to Portland Bill at the south of the island. If you're returning from Weymouth by train, the station is just in land, by the clock tower on the sea front. Getting back from Weymouth to Lulworth is not especially easy. 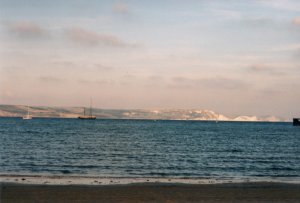 There are buses to Lulworth, but very few from Weymouth. If you're traveling by car, it may be a good idea to park at Wool station and take the bus from there to Lulworth for the start of the walk. Then you can get a train (running hourly), back to Wool station. 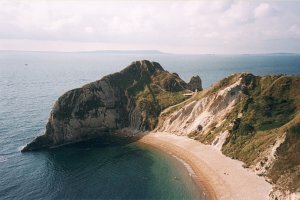 Otherwise, you will probably need to return to Wool station by train, then take a bus from there to Lulworth Cove. First Southern National service 103 runs 4 times a day between Wool and Lulworth, Mondays to Saturdays. Finally, Dorset Linkrider / Weaverbus service 30 runs between Wareham (station), Lulworth, Moreton (station), Osmington and Weymouth. The service is infrequent, and varies depending on the season. All these bus services stop at rail stations on the London Waterloo to Weymouth rail line. Timetables of all these services are below. Ordnance Survey Landranger map 194 covers this area of the coast path and is available from most book shops nationwide. It is also stocked at the Weymouth Tourist Information Centre. 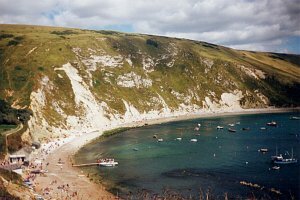 Multimap is a web site which provides maps of the UK, including around around Lulworth, Osmington and Weymouth. 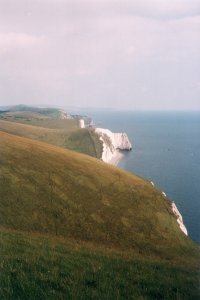 The links below will be of most use to the coast path from Lulworth to Weymouth. These maps join to provide the complete coast path between the two points.